Happy Monday lovelies! I hope you had a great weekend. Mine was full of homework, cleaning, and lots of fall activities to ring in the official start of my FAVORITE season!! Seriously, I am sure you are all feeling the fall frenzy; the start of football, the change of the leaves, the crisp air, the return of the beloved pumpkin spice latte, and most of all bundling up in the rich colored and cozy textured clothing that define fall fashion. Here in the mitten, the weather has been teasing towards fall since August, which has been wonderful as the weather dipped into the 60’s and frustrating when the temperature fluctuated up. Either way, it feels like fall has finally arrived and I could not be more happy. One of my absolute favorite things to do in the fall is visit local cider mills and apple orchards. There is something about being outside, hot cider in hand, strolling through the woods, that just feels “right.” Like all the stars have aligned to give you an amazing gift. Yesterday was definitely one of those days. 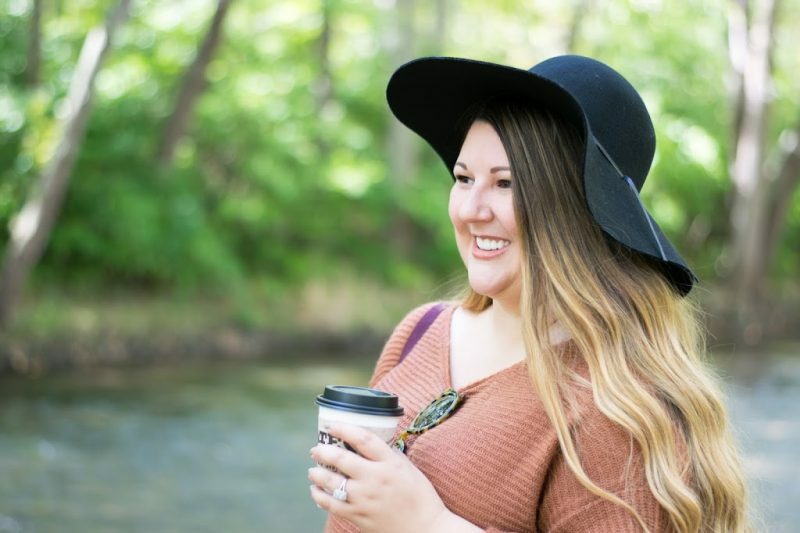 The weather was overcast and cool, the river by the cider mill was bubbling and flowing briskly, the cider with hot and spiced, and I was wrapped up in my newest, coziest sweater as we explored the great outdoors. For our first official fall excursion, I chose to wear my new Old Navy Rockstar Cords in California Plum, which just screamed fall to me, with tons of layers on top. I love the luxe color of these pants and decided to pair the rich purple with its complementary hue mustard, for a bold fall look. Mustard promises to be a must have color this fall, and I have seen many fabulous pieces in the color. I picked up this mustard tank from Target a few weeks ago, just to get my feel wet a little on the trend. Since the Mustard and plum are very strong colors, I chose to keep the rest of my accessories neutral, enter the taupe booties, tortoise necklace, leopard scarf, cognac bag, and taupe-y brown sweater. Finally, since the cider mill is off a river and we knew we’d be walking the adjacent trails, I grabbed my navy puffer vest to stay warm. I can’t stop wearing this pave link bracelet from Hawthorne Collection! We headed to Yates Cider Mill in the late afternoon, after having brunch with my sister, heading to Michael’s to get supplies for dressing my apartment up for fall, and doing some homework. It was a relaxing afternoon with my bf, spent walking the trails and snapping these photos, followed by hot cider and fresh cinnamon sugar donuts. During our walk, my light layers were comfy and kept me warm along the river. Overall, it was the perfect start to fall. Here are some other pics from my iPhone. The leaves are already starting to change color! Fresh cinnamon sugar donut, yum! How did you spend the first day of fall? What trends are you most excited to try this fall?